Above: The new museum will be built at Myilly Point, site of the old Kahlin Compound. Archival photograph, from the government’s Have Your Say page on this project. The new cultural institutions destined for Alice Springs – the national Indigenous art gallery and the, as yet, separate national Indigenous cultural centre – have yet to be discussed in any kind of public forum. In contrast, the cultural institution destined for Darwin – the Museum of the Northern Territory (MNT) – was the subject of a public meeting this week. It was attended by a disparate group of eight locals, counting myself and not counting a public servant who took copious notes and said she was authorised to answer questions on the national Indigenous art gallery, should any arise. They didn’t. That project surely deserves its own public meeting, and one museum was enough to be getting on with in the allotted two hours. “Community engagement specialist” Daniel Hall expressed his disappointment in the low turnout especially given all the work he’d done. His networking hadn’t managed to connect with Dianna Newham, she told him. Curator at the National Pioneer Women’s Hall of Fame (NPWHF), she was the only professional from the local museum sector to attend and only knew about the meeting from an advertisement. There was no-one present from Darwin’s museum sector. The other visitors were Sophie Cleland from ARM Architecture and Katy Moir from troppo, Darwin-based architects who have practices also in Adelaide, Perth and Townsville. The two firms have been engaged to provide “a return brief for the design and development” of the museum on a large site at Myilly Point. 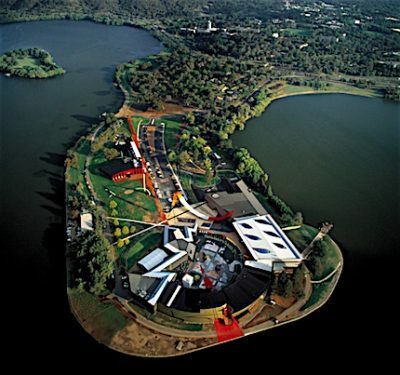 Left: National Museum of Australia, Canberra, designed by ARM. Image from their website. As with the projects proposed for Alice Springs, where the discussion is about where it/they will be built before the public has been given any real idea of the institutions’ scope and direction, the process for the MNT seems also to be hastening towards construction as part of an urban revitalisation agenda. This is in contrast to the process of the National Museum of Australia, for instance, where the intellectual and conceptual framework and collections were developed over decades before a site was chosen and a building built, as Ms Newham pointed out. The National Museum of the American Indian, as previously reported here, began with the appointment of a founding director to create a guiding vision for the museum, well before any architects came on board. The Territory Government says its museum will “showcase what it means to be a Territorian”. It will “incorporate the Territory’s continuous history including that of Aboriginal peoples, the world’s most ancient living culture – from the Centre to the Top End. It will also include stories of centuries of diverse early cross-cultural contact, and acknowledge the Territory’s more recent influence of British colonial, Chinese, Asian, Afghan, Greek and other European cultures”. That’s about as much detail of scope and direction that there is to go on. The consultants are otherwise working with a blank canvas. Not even a definition of ‘museum’ was clear. Ms Newham suggested that a museum is distinguished by its objects, the material culture that it interprets. What collection would this new museum be working with? she asked. Mr Hall said the forthcoming 10 Year Museums Master Plan for Darwin and Palmerston should answer this question. However later in the discussion he ventured that a contemporary museum might not be focussed on a collection of objects, but rather be something like the annual Garma Festival, held on country in north-east Arnhem Land. Right: Some of the humble objects in the National Pioneer Women’s Hall of Fame collection used to ask questions about how work is valued in our society. Photo from our archive. Mr Hall’s flexibility of concept was certainly pleasing to two of the locals attending the meeting, artists working with performance, Frankie Snowdon and Jonny Rowden. They were keen to see the museum incorporate spaces for dance and other performance. The architects responded to this suggestion with enthusiasm. 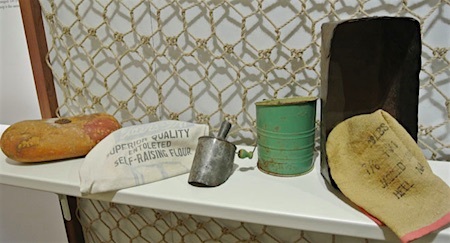 Rowden, who uses bread-baking in his artistic practice, also saw a role for food beyond catering – the museum, indoor and out, could be a place for learning about and interpreting Territory food cultures. Maybe the project should really be a cultural centre, said Ms Snowdon, especially as the base for a number of arts organisations in Darwin’s Frog Hollow is about to be sacrificed to the development of a new access road, Barneson Boulevard. Mr Hall agreed that “museum” may be the wrong word to be using but whatever its label, it will be an institution focussed on representations of the Northern Territory and its peoples. To this end, what stories did those gathered think the museum should tell about Central Australia? 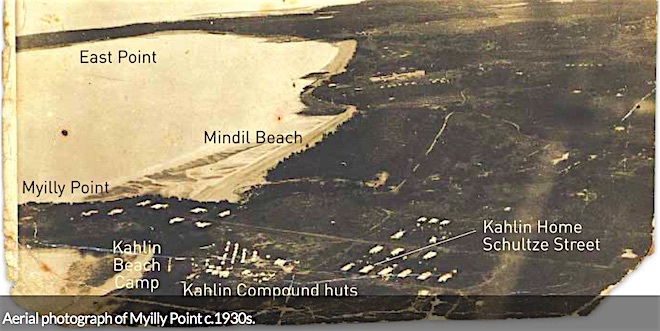 There were some specific suggestions, such as the story of The Bungalow, the home for Aboriginal children of mixed-descent, part of the Territory’s controversial Stolen Generation history, as is the the Kahlin Compound which previously (1913-38) occupied the Myilly Point site where the museum will be built. Left: The new museum should have spaces for performance, it was argued. 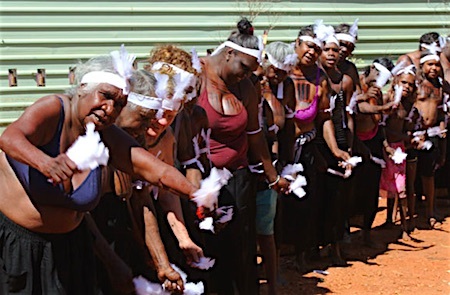 Here women and girls in Yuendumu dance to help inaugurate the Men’s Museum in their community. Photo from our archive. But the discussion tended more to broadly reflective comments. Local historian Alex Nelson noted the resistance that could be felt in Central Australia to “give up our history” to the Top End: “We want it here.” At the same time, he said, a museum in Darwin offered an opportunity to The Centre to have its history and contribution better understood in the Territory’s capital. Ms Newham emphasised the principles of openness and inclusion and noted the difficulty that the siting of this museum may present, given the traumatic history for many of the Kahlin Compound. The NPWHF confronts this problem in its occupation of the Old Gaol site and buildings, she said. David Hewitt, a veteran worker on Aboriginal communities who is now keenly involved in all matters heritage in town, said Adelaide House experiences a similar problem: Aboriginal people think of it as a place of European heritage only, whereas its history shows this is not so. Ms Snowdon spoke of the importance of the Territory “owning” its difficult history, as for instance Berlin does with its Memorial to the Murdered Jews of Europe. There were also a number of challenges from the gathering to the idea of massive expenditure on this museum ($50m is on the table thus far) when the many small local museums, such as the NPWHF, Adelaide House, the Aviation Museum, even the Museum of Central Australia, are starved for funds as are the arts organisations. This, as Ms Snowdon said, “feels like a slap in the face”.